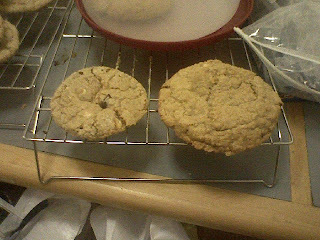 Baking and Mistaking: Big, chewy and delicious! Hello friends, I'm back. I know I haven't blogged in a while, but unfortunately, when things get crazy, blogging takes a backseat on my priority list. But not in my heart. Sigh. Well, here we go: big, chewy chocolate chip cookies, fresh from the oven. These were a recipe I found in The Golden Book of Chocolate (recipe below). Of course, they looked good, and I already had all the ingredients! Well, I made these last week, on a very busy night, and...I got a little impatient towards the end. See, I'm working in a very small kitchen here, with a very small oven, where I could only really cook 6 of these babies at a time. And I had to cool them on the baking sheet, meaning even longer in between batches. (Yes, I could buy a second baking sheet, but I'm cheap). So anyway, after 3 batches of cookies, I was getting pretty frustrated, running short on time and patience, and wanted to just finish up. I couldn't even start washing up because the batter was still in the bowl. Well, thats when I came up with my bright idea. I looked at the remaining batter, and back at the baking sheet....and decided I would make...six. giant. cookies. These were enormous, and of course required almost double the cooking time, but I could then relax, sit and finish. Impatience is a virtue my friends. Check out the first and last batch of cookies side by side above. Beat the butter and sugars until creamy. Add eggs one at a time, mixing well. Beat in the vanilla, flour, baking powder, baking soda and oats. Shape dough into golf ball sized cookies and place 3 inches apart on baking sheet lined with parchment paper. Bake for about 10 minutes on 350 F.
Cool on baking sheets for 10 minutes then transfer to wire rack.